So what do you think?? If you would like to you can vote for me or whichever mani you like here. You can't vote until June 18th though. I am definitely going to do this mani again but obviously use different colors. I have Color Club Cosmic Fate coming in the mail. A beautiful orange holo!! I plan to use that color to try this stamp again. I am going to also try it with a purple polish. It will be so pretty! 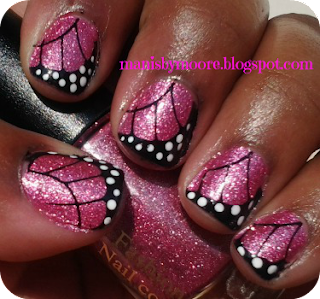 Have you ever hand a mani you just simply do not want to take off?? What color's do you think would look best with this monarch butterfly stamp?? Thanks for stopping by! Oh, so cute! You've done such a great work with these! Hey girlie! I hope you are having a fantastic Sunday. I LOVE this mani!! BEAUTIFUL! If you don't remember me, we chat about mani's when we see each other at CSL. I finally got around to checking out your awesome blog. I remember you!! Welcome!! I haven't seen you in a while! I hope you have been doing good! I go earlier in the day now since school is out! Thank you so much for stopping by!